I’ll just let the title to this post say, and ask, it all. I just finished the book Gilead, by Marilynne Robinson. I know, Shotts, you had recommended it to me a while ago, and my mother had suggested it before that even. It seems you both know what I will appreciate, certainly in this case. It really is difficult for me to describe how much reading that book meant to me. It kind of seared me. It succeeds on so many levels that at times it was difficult for me to think of it as fiction, and yet that sounds as if the fact that it is fiction is somehow a detraction. What a miracle that something imagined can emanate into the minds of others so entirely. Of course, I’m sure that all of this sounds like blathering, and perhaps others would not have the same experience I had with the novel as they have not had the same experience with life, but I am deeply grateful for having had the opportunity to experience it. I’m wondering why I am posting this, but for some reason feel compelled. Since I have been on the couch or in bed lately, I managed to read a bit. 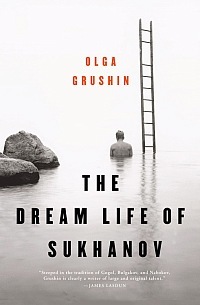 I just finished The Dream Life of Shukhanov by Olga Grushin. It was a terribly engaging book that takes place in real time over three or four days, but covers in flashbacks much of the life of a Soviet artist/critic. There are several narrative techniques that are interesting, such as the way the book flows from third person narration to first. But I guess the most valuable part of the book to me was what it said about living with the choices we make, the life we live, and the art we do and don’t make. It reminded me a bit of Ishiguro’s novels in that it begins to blur the main character Sukhanov’s past with his present in an effort to reconcile the two lives he has led in a manner that is almost surreal. Thanks Ned for posting the Story of Stuff. I think that it is largely preaching to the choir (with emphasis on “preach”) on this blog but still it is good to know that there are people out there fighting the good fight. I’ve been thinking about these issues over the last few days. I hope to post a more robust response later this week. So since I took twenty minutes of my time I ask you to take twenty minutes of your time to review this TED talk on A Brief History of Violence by Harvard linguist, Steven Pinker. Shotts if you are looking for an “popularized” science book, you can’t go wrong with anything by Pinker though I have only read The Language Instinct. Anyway, this is sort of an evidenced based “feel good” story about how the chances of human being killed by another human have consistently dropped throughout history. Pinker talks about why we may believe that the opposite is true and what we may have done right in the last 400 years or so to make this possible. Please take time to view this. I think it’s really important. Well, maybe not, but it has been pretty quiet. It was good to see Peters, and Toby, Steph, and Clara (at least for a few minutes) as well as speak with Shotts (as well as J.E. for a few minutes). I’d like to post a bunch of stuff, but I am afraid I don’t have time for much, but check this out. It is pretty elementary, but pretty enlightening at the same time. It will require about twenty minutes of your hard earned time. I think it will take time for our country to warm to this info; so the more we can pass it around, the better. For reasons known to all of you, 2007 was a year in which I read very few books (though I shouldn’t feel too bad as I’m sure I read about 1000% more the national average.) Anyway here’s my rundown. The View From the Center of the Universe by Joel Primack and Nancy Abrams may be the most influential book I’ve read since The Moral Animal. This book takes the popular understanding of the “scientific worldview” and turns it on its head by rescuing our cosmology from the meaningless void. As with most science and philosophy texts it takes a lot of work to get through but I highly recommend it. You should expect several bog entries in 2008 referring to View from the Center. I as I think I’ve mentioned before, I highly recommend Susanna Clark’s Jonathan Strange and Mr. Norrell — a novel about English magic during and after the Napoleonic Wars. It’s a fantasy novel that reads like Jane Austen. Oh yeah, I think I read something about Harry Potter and some stolen horses or something or other. Since I live the self proclaimed “Live Music Capital of the World” it is only right that my musical tastes have been largely influenced by what I’ve seen in concert. I’ve included YouTube links if you want to see concert footage of what I saw. It’s not my video but there’s always some fan with a video phone these days. One of the best albums and concerts of the year was Explosions in the Sky, “All of the Sudden I Miss Everyone.” This was the first rock concert (or post rock) that I’ve been to where I actually wanted it to be louder – just to see what would happen. Would my brain explode? Would me liver liquefy? Perhaps I wanted it louder because there are no distracting lyrics just music. Explosions in the Sky is music that builds you up – like getting a hug from the Iron Giant. Seeing Bjork was amazing of course and she had a great new album this year too. As always, thrilling to the core. M. I. A. was the discovery of the year for me. She is the complete artist: music, set design and costume design. I’ve always been a sucker for artists who do everything themselves. Somehow she is able to take on the hip hop megalomaniac persona but also make you feel like stands for something besides herself if not through her lyrics then through the whole of her artistry. My guilty pleasure of the year is Interpol. There new album “Our Love to Admire” doesn’t really cover any new ground but I’ve enjoyed nonetheless. They clearly stand for nothing but they’re just so damn cool. Impossibly cool. You really have to see it to believe it. Another great find was LCD Soundsystem and their album “Sound of Silver.” From the bravado of “North American Scum” to the more introspective “All My Friends” they are the sort of band you get stuck in you head for days and you don’t mind a bit. That’s all for now. I’ll get to the rest of my year of media after I get the rest of this crown molding up….